Well, I’m not, Alex is. I just get to say how. What follows is an amalgamation of information on many web-sites, plus my own experimentation. Now, before we get started, let’s clarify why you’d want to do this. Quite frankly, because they’re amazing. If that’s not a good enough reason, how about “I don’t own a grill” or “it’s too cold to grill”. 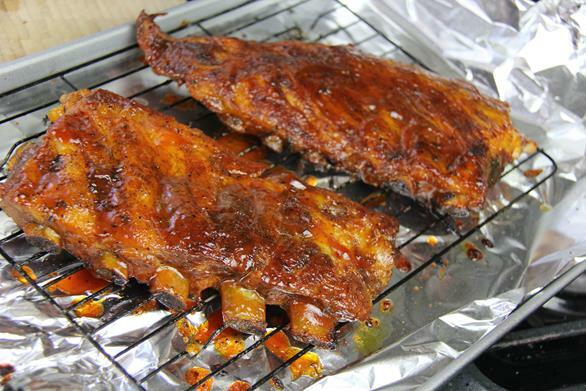 Ribs must be thawed first, so if they’re frozen, move to the refrigerator a day or two beforehand or set in some cold water large enough to cover them, usually the whole sink. If using a roaster, line with foil (Teflon or shiny side up) … if possible, make the foil “water-tight” so cleanup is much easier later … the chips will bake onto the bottom, and you’d really rather that be foil than the roaster itself! Use a sharp knife and slide it under the white membrane on the back of the ribs so that the knife is between the meat and membrane. Remove all of the outer membrane and discard. Remove from oven, cut apart (if necessary), and enjoy!